"I am the mother of the wicked, as I am the mother of the virtuous. Never fear. Whenever you are in distress, just say to yourself 'I have a mother.'" Sarada Devi (Bengali: সারদা দেবী; ) (22 December 1853 – 20 July 1920), born Saradamani Mukhopadhyay (Bengali: সারদামণি মুখোপাধ্যায়), was the wife and spiritual counterpart of Ramakrishna Paramhansa, a nineteenth-century mystic of Bengal. Sarada Devi is also reverentially addressed as the Holy Mother (Sri Maa or শ্রীমা) by the followers of the Ramakrishna monastic order.Sarada Devi or Sri Sri Ma is one of the notable woman saints and mystics of the nineteenth century.She paved the way for the future generation women to take up monasticity as the means and end of life. Infact Sri Sarada Math and Ramakrishna Sarada Mission situated at Dakshineshwar is based on the ideals and life of Sri Sri Ma.Sarada Devi played an important role in the growth of the Ramakrishna Movement. Sarada Devi was born in Jayrambati. At the age of five she was betrothed to Ramakrishna, whom she joined at Dakshineswar Kali temple when she was in her late teens. According to her traditional biographers, both lived lives of unbroken continence, showing the ideals of a householder and of the monastic ways of life. After Ramakrishna's casting off his mortal body, Sarada Devi stayed most of the time either at Jayrambati or at the Udbodhan office, Calcutta. The disciples of Ramakrishna regarded her as their own mother, and after their guru's death looked to her for advice and encouragement. The followers of the Ramakrishna movement and a large section of devotees across the world worship Sri Sri Ma Sarada Devi as an incarnation of the Adi Parashakti or the Divine Mother. Saradamani Devi was born of Brahmin parents as the eldest daughter on 22 December 1853, in the quiet village of Jayrambati in present day West Bengal, India. Her parents, Ramachandra Mukhopadhyay and Shyama Sundari Devi, were poor. Her father Ramchandra earned his living as a farmer and through the performance of priestly duties. According to traditional accounts, Ramachandra and Syamasundari had visions and supernatural events foretelling the birth of a divine being as their daughter. Sarada lived the simple life of an Indian village girl. As a child Sarada—then known as Saradamani—was fascinated by traditional Hindu folklore and narratives. As in the case of most girls of rural upbringing, she did not receive any formal education but learned to serve others as she helped her mother run a large household and looked after her younger brothers. During the terrible famine of 1864, Sarada worked ceaselessly as her family served food to hungry people. She was interested in the clay models of goddesses Kali and Lakshmi, which she worshiped regularly. She is said to have started meditating from her childhood and traditional accounts recount her mystic visions and experiences. According to Sarada Devi, she used to see a bevy of eight girls of her age coming from an unknown place and escorting her in her chores during her childhood. Ramakrishna—then known as Gadadhar Chattopadhaya and a priest of the Dakshineswar Kali Temple since 1855—was practising spiritual austerities. His mother and brother thought that a marriage would be a good steadying effect on him, by diverting his attention away from spiritual austerities and visions. It is reported that Ramakrishna himself indicated Saradamani as the bride. In May 1859, Sarada was betrothed to Ramakrishna. Sarada was 5 years old and Ramakrishna was 23; the age difference was typical for 19th century rural Bengal. After the betrothal, Sarada was left to the care of her parents and Ramakrishna returned to Dakshineswar. Sarada next met Ramakrishna when she was fourteen years old, and she spent three months with him at Kamarpukur. There, Ramakrishna imparted Sarada instructions on meditation, spiritual life. 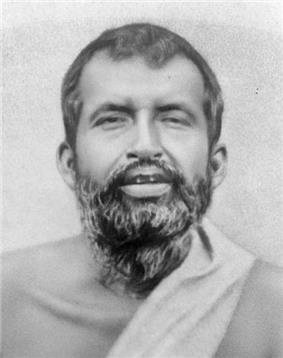 Ramakrishna's frequent bhava samadhi (ecstasy) and unorthodox ways of worship led some onlookers to doubt his mental stability, while others regarded him as a great sant. Sarada joined Ramakrishna at Dakshineswar in 1872 on her own accord when she was eighteen, after hearing these rumours about his mental health. She found Ramakrishna to be a kind and caring person. The south side of the nahabat (music tower), where Sarada Devi lived in a small room on the ground floor. At Dakshineswar, Sarada Devi stayed in a tiny room in the nahabat (music tower). She stayed at Dakshineswar until 1885, except for short periods when she visited Jayrambati. By this time Ramakrishna had already embraced the monastic life of a sannyasin; as a result, the marriage was never consummated. As a priest, Ramakrishna performed the ritual ceremony—the Shodashi Puja where Sarada Devi was made to sit in the seat of goddess Kali, and worshiped as the divine mother Tripurasundari. According to Swami Saradananda a direct disciple of Ramakrishna, Ramakrishna married to show the world an ideal of a sexless marriage. Ramakrishna regarded Sarada as the incarnation of Divine Mother, addressing her as Sree Maa (Holy Mother) and it was by this name that she was known to Ramakrishna's disciples. Sarada Devi's days began at 3 am. After finishing her ablutions in the Bhāgirathi-Hooghly, she would practice japa and meditation until daybreak. Ramakrishna taught her the sacred mantras, and instructed her how to initiate people and guide them in spiritual life. Sarada Devi is regarded as Ramakrishna's first disciple. Except for her hours of meditation, most of her time was spent in cooking for Ramakrishna and the growing number of his devotees. While Sarada Devi remained completely in the background, her unassuming, warm personality attracted some female devotees to become her lifelong companions. During Ramakrishna's last days, during which he suffered from throat cancer, Sarada Devi played an important role in nursing him and preparing suitable food for him and his disciples. It is reported that after Ramakrishna's death in August 1886, when Sarada Devi tried to remove her bracelets as the customs dictated for a widow, she had a vision of Ramakrishna in which he said, "I have not passed away, I have gone from one room to another." According to her, whenever she thought of dressing like a widow, she had a vision of Ramakrishna asking her not to do so. After Ramakrishna's death, Sarada Devi continued to play an important role in the nascent religious movement. She remained the spiritual guide of the movement for the next 34 years. After Ramakrishna's death, Sarada Devi began her pilgrimage through North India, accompanied by a party of women disciples including Lakshmi Didi, Gopal Ma, and Ramakrishna's householder and monastic disciples. The party visited the Vishwanath Temple of god Shiva at Banaras and the city of Ayodhya, which is associated with life of god Rama. Later, she visited Vrindavan which is associated with god Krishna. According to traditional accounts, at Vrindavan, she experienced nirvikalpa samadhi and began her role as guru. She initiated several of the Ramakrishna's disciples including Mahendranath Gupta, Yogen with a mantra. According to her traditional biographers and disciples, to call her "Mother" was no more expression of respect and all those who met her became aware of a maternal quality in her. 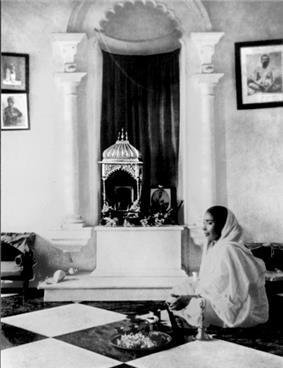 Sarada Devi worshiping at her Udbodhan residence in Calcutta. After the pilgrimage, Sarada Devi stayed alone in Kamarpukur, Ramakrishna's native village also where he was born. There, she endured poverty, verging on starvation for a year. In 1888, when the news reached the lay and monastic disciples of Ramakrishna that she needed their care and attention, they invited her to Calcutta and arranged for her stay. 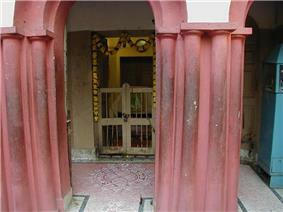 Swami Saradananda built a permanent house for Sarada Devi in Calcutta. 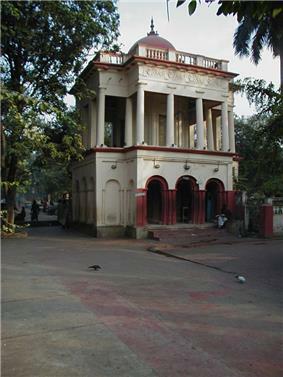 The house was named the Udbodhan House, after the Bengali monthly magazine conducted by the Ramakrishna Math. 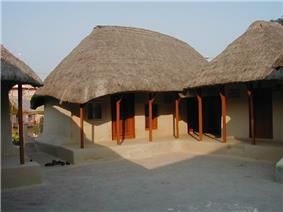 It is also called Mayerbati ("Holy Mother's House"), where she spent the longest period of her life outside Jayrambati. Sarada Devi went to Calcutta because she had many hardships in Kamarpukur. She had no financial resources and about no one could take care of her. She tried to hide her situation, but it leaked out. When the devotees at Calcutta heard this, they persuaded Sarada Devi to come to Calcutta. At Udbodhan House, Sarada Devi was accompanied by other women disciples and devotees of Ramakrishna, Golap Ma, Yogin Ma, Gopaler Ma, Lakshmi Didi and Gauri Ma being the best known. An increasing number of people began to flock for guidance, instructions and spiritual initiation. Other Western women followers of Ramakrishna Order including Sister Nivedita and Sister Devamata formed close relationship with her. According to her biographers, her innate motherliness put visitors at ease. Swami Nikhilananda, her direct disciple writes, "Though she had no children of the flesh, she had many of the spirit." She regarded all her disciples as her own children. Sarada Devi received the highest reverence from the Ramakrishna Order and its devotees. Ramakrishna had bade her continue his mission after his death and wanted his disciples not to make any distinction between himself and her. According to her devotees and traditional biographers, the hospitality of Sarada Devi was unique and was characterised by motherly care and solicitude. Traditional accounts recount the mystical experiences of her devotees. Some dreamt of her as a goddess in human form though they had never seen her picture before. Others reportedly received their initiation from her in their dream. One such example is of Girish Chandra Ghosh, the father of Bengali drama, who reportedly saw Sarada Devi in a dream when he was nineteen years old and received a mantra. When he met her many years later, to his astonishment she was the same person in the dream. Sarada Devi spent her final years moving back and forth between Jayrambati and Calcutta. In January 1919, Sarada Devi went to Jayrambati and stayed there for over a year. During the last three months of her stay, her health seriously declined. Her strength was greatly impaired and she was brought back to Calcutta on 27 February 1920. For the next five months she continued to suffer. Before denouncing her mortal existence, she gave the last advice to the grief-stricken devotees, "But I tell you one thing—if you want peace of mind, do not find fault with others. Rather see your own faults. Learn to make the whole world your own. No one is a stranger my child: this whole world is your own!" This is considered as her last message to the world. She left her mortal existence at 1.30 am on 20 July 1920. The holy body was cremated at the Belur Math. Sarada Devi did not write any books; her utterances and reminiscences have been recorded by her disciples including Swami Nikhilananda, Swami Tapasyananda. Though uneducated Sarada Devi's spiritual insight and utterances are highly regarded by scholars like Gayatri Chakravorty Spivak, who writes, "We have bits and pieces of her exquisite remarks as testimony." "I tell you one thing. If you want peace of mind, do not find fault with others. Rather see your own faults. Learn to make the whole world your own. No one is a stranger, my child; the whole world is your own." One must have devotion towards one's own guru. Whatever may be the nature of the guru, the disciple gets salvation by dint of his unflinching devotion towards his guru. Sarada Devi played an important role as the advisory head of a nascent organisation that became a monastic order devoted to social work—the Ramakrishna Mission. Gayatri Spivak writes that Sarada Devi "performed her role with tact and wisdom, always remaining in the background." She also initiated several prominent monks into the Ramakrishna Order. Swami Nikhilananda, who was a freedom fighter and a follower of Mahatma Gandhi, accepted Sarada Devi as his guru and joined the Ramakrishna Order. He eventually founded the Ramakrishna-Vivekananda Center in New York. Though uneducated herself, Sarada Devi advocated education for women. She entrusted Devamata with the implementation of her dream—a girl's school on the Ganges, where Eastern and Western pupils could study together. In 1954, Sri Sarada Math and Ramakrishna Sarada Mission, a monastic order for women was founded in the honour of Sarada Devi. Swami Vivekananda wrote a letter to her to get her opinion about his intention to attend the Parliament of Religions in Chicago. Only after receiving the blessing from her did he decide to go to America. ^ Mookerjee, Nanda (1978). 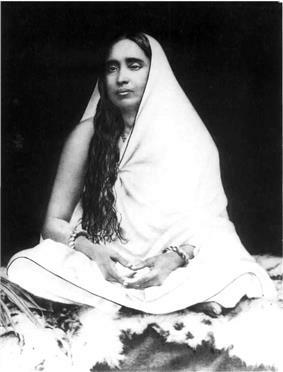 Sri Sarada Devi, consort of Sri Ramakrishna. Firma KLM. p. 15. ^ "Sri Sarada Devi". Indian Express. 22 December 2003. Retrieved 3 April 2009. ^ Saradeshananda, Swami. "Introduction". The Mother As I Saw Her. ^ Pavitrananda (1967). A Short life of the Holy Mother. ^ a b Gahanananda, p. 97 "Vain is your search in this place and that. Go to Jayrambati, and there in the house of Ramachandra Mukhopadhyaya, you will find her who is marked out for me." ^ Jackson, p. 18 "Such child marriages were still widespread in nineteenth-century India, despite vehement condemnations by both English authorities and Hindu reformers. Analogous to the Western betrothal, child marriage committed the partners to one another, with the actual of living together and assuming family responsibilities delayed until puberty." ^ Muller, Max (1898). a's Life"nshri"Râmak. Râmakrishna his Life and Sgyings. pp. 52–53. ^ Isherwood, Christopher; Robert Adjemian (1987). The Wishing Tree. Vedanta Press. p. 103. ^ Rolland, Romain (1929). "The Return to Man". The Life of Ramakrishna. p. 59. ^ Jones, Kenneth W. (1989). Socio-religious reform movements in British India. Cambridge University Press. pp. 42. ^ Lisa Lassell Hallstrom (1999). Mother of Bliss. Oxford University Press. p. 69. ^ Prophet, Elizabeth Clare; Annice Booth (2005). Mary Magdalene and the Divine Feminine. Summit University Press. pp. 112. ^ a b Leo Schneiderman (Spring 1969). "Ramakrishna: Personality and Social Factors in the Growth of a Religious Movement". Journal for the Scientific Study of Religion (London: Blackwell Publishing) 8 (1): 60–71. ^ Sugirtharajah, Sharada (2003). Imagining Hinduism. ^ Prabhavananda (1979). Spiritual Heritage of India. Vedanta Press. p. 342. ^ The Gospel of the Holy Mother, "Introduction"
^ Foxe, Barbara (1975). Long journey home. Rider. p. 166. ^ Oldmeadow, Harry (2004). Journeys East. World Wisdom, Inc,. pp. 39–40. ^ a b Levinsky, Sara Ann (1984). A Bridge of Dreams. SteinerBooks. p. 140. ^ Campbell, Joseph; Robin Larsen; Stephen Larsen; Antony Van Couvering (2002). Baksheesh and Brahman. New World Library. pp. 326. ^ Laderman, Gary; Luis D. León; Amanda Porterfield (2003). Religion and American Cultures. ABC-CLIO. pp. 121. Ghanananda, Swami; John Stewart-Wallace (1979). "Sri Sarada Devi". Women Saints of East and West. Vedanta Press. pp. 94–121. Jackson, Carl T. (1994). Vedanta for the West. Indiana University Press. Babaji Bob Kindler (2000). Sri Sarada Vijnanagita: Her Teachings, Selected and Arranged in Verse Form. SRV Associations. Swami Saradeshananda. The Holy Mother as I Saw Her. Swami Tapasyananda. Sri Sarada Devi ; The Holy Mother. Sri Ramakrishna Math. Sri Sarada Devi : a Biography in pictures. Advaita Ashrama. 1988.
saradadevi.info, Gospel of Holy Mother, Teachings.